Get Ready for a Real Turkey Feast! - The creative forces behind Reel FX's new animated feature Free Birds discuss the choices behind their time-traveling turkey pic. Miyazaki's Fond Farewell - Legendary Japanese animation director Hayao Miyazaki bows out of the limelight with his final Studio Ghibli feature, The Wind Rises. Out-of-This-World Visuals - Framestore's vfx master Tim Webber discusses the stunning CG elements of Alfonso Cuarón's Gravity. It All Adds Up Beautifully! - The whimsical new PBS series Peg + Cat helps kids understand simple mathematical concepts without coming across as boring or pedantic. Meet the Buyers: 2013 Edition - Before you attempt to rub elbows with key toon buyers at the MIPCOM market, grease those puppies up with the inside scoop on their likes, dislikes and possible conversation starters. 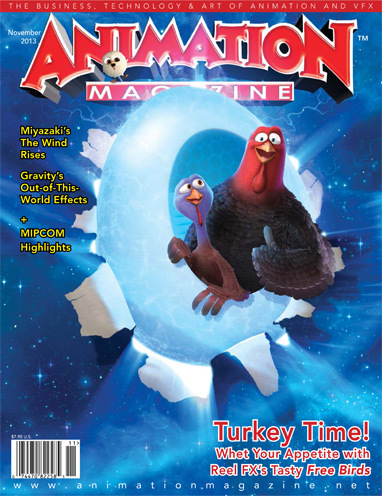 Free Birds, Aunt Hilda!, The Wind Rises, Peg + Cat, Gravity, MIPCOM and much more!